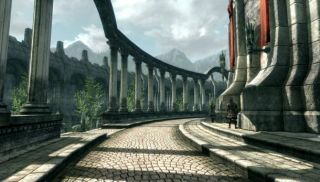 Got an hour to kill and a hankering to do some sightseeing in Cyrodiil? If you find yourself in that rather odd situation, then I recommend you have a look at the new Skyblivion gameplay trailer. Skyblivion, as the name suggests, is a remake of the 2006 Elder Scrolls RPG Oblivion in the more up-to-date and visually impressive Creation engine that powered the 2011 Elder Scrolls RPG Skyrim. It's very much akin to Skywind, a similar resurrection of the 2002 Elder Scrolls RPG Morrowind, which I think generally gets more attention because it's so much older and thus in more dire need of a facelift. The Skyblivion world looks quite a bit emptier than I recall the Imperial Province being, although it has been an awfully long time since I was last there. It's also very early in the development process: The YouTube description says the video is taken from version 0.2 of the mod, which among other things lacks a "navmesh" that guides NPCs and keeps them from wandering into places they're not supposed to go. "Navmesh needs to be done if this is ever going to be in a playable state with quests," the mod makers said in a comment. "This is a huge task considering it has to be done by hand and Cyrodiil is huge." The mod is apparently progressing toward a public release of version 0.3, but there's no indication as to when it might be ready. For now, enjoy the view—and if you want to find out more about what's going on, or even chip in to help (Skyblivion, as Destructoid notes, is being created entirely by volunteers) you may do so at The Elder Scrolls Renewal Project.